Dozens of Evangelical Christian leaders from the greater New York area united at the Faith Exchange, hosted by Rev. Daniel Stratton in New York City on Friday morning, July 25, to express their support for Israel in its current conflict with the Palestinian terrorist Hamas group. They spoke out to expose the utter moral disparity between Israel and Hamas. The evangelical leaders repeatedly affirmed their love of both the Palestinian people and the Israeli people. They also urged “all people of conscience to speak against the malignant morals of the Hamas movement that terrorizes both their own Palestinian people and Israel,” according to Dr. Paul de Vries, president of the NY Divinity School, who organized the press conference. Evangelical leaders joined media and Ambassador Ido Aharoni, consul general of Israel in New York, to discuss the importance of supporting Israel during this time of conflict and violence. Several important topics were discussed by the ministers, including what they believe to be a clear distinction of good versus evil between Israel and Hamas in the way they treat their own citizens. “Love is our primary response, equal love to Palestinians and Israelis,” according to Rev. Marcos Miranda, president of the NY Chaplaincy Services. “Because of the morally disgusting use of people as human shields and Hamas seeking to increase Palestinians’ own casualties, the real issue is our support of human life. For life we must stand with Israel and the Palestinian people, and strongly against Hamas.” He mentioned the trend in the media to paint Israel as a bully but added that the stronger man or woman in a fight doesn’t make them a protagonist. He called on Abbas to break all ties with Hama for only then can his statements be taken seriously. “The media tries to paint this as two forces that we have to bring together and try to resolve their differences. One is terroristic and the other supports the core biblical values of life, liberty and justice. There really is no problem choosing sides between Hamas and Israel,” according to de Vries. “The Palestinian people are the ones we love, along with the people of Israel, but the abuse by the tyrannical leaders of the Palestinians is just incalculable.” An example that Dr. de Vries mentioned was the heavy investment Hamas has made in dozens of very long cement-reinforced tunnels to deliver death and terror to the Israelis—but Hamas has not used its tons of cement to build any underground shelter for Palestinian civilians. 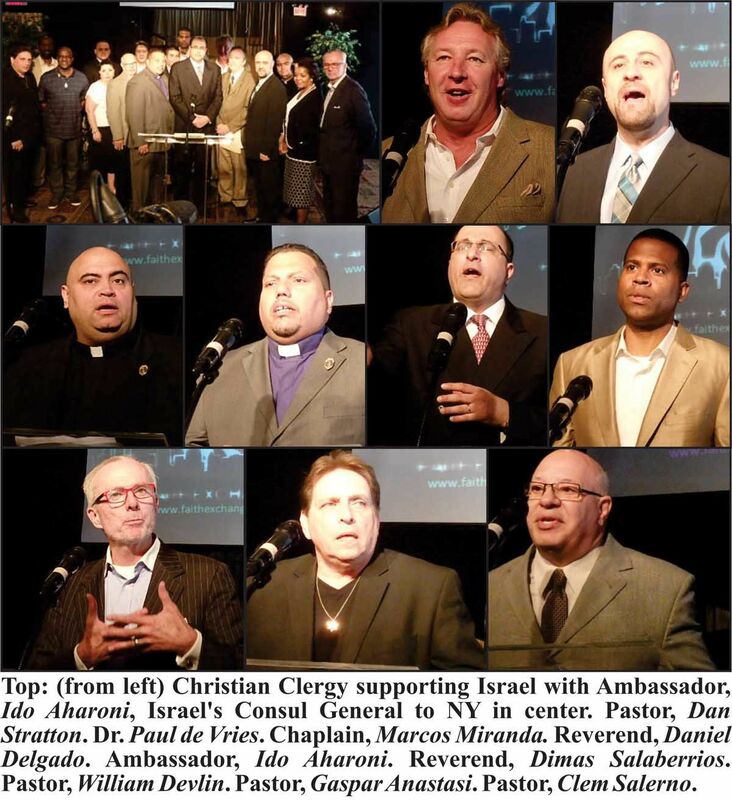 Reverend Dimas Salaberrios of the Infinity Bible Church and Concerts of Prayer, representing 1000-2000 clergy said that Hamas must have a new vision, that we have seen them blow things up and it is now time to see them build things up. The Rev. Robert Stearns, executive director of Eagles' Wings ministry, said it was important to call together different streams of Christian faith leaders in the tri-state area to show that this conflict is not just an issue important to Jews or evangelicals, but rather that Hamas’ whole orientation is a human rights offense that must be addressed by all "decent human beings." Sterns added, "If Hamas was neutralized and the Palestinian people put down their arms tomorrow there could be a Palestinian state of peace and security in the area," Stearns said, adding however that if "If Israel put down their arms, there would be no Israel. That's the reality." Ambassador Ido Aharoni, Consul General of Israel in New York, was welcomed warmly and gave a master class on the state of the current crises. Setting the stage, he mentioned that over 2000 missiles were dropped in a space smaller than Rhode Island. He reminded us that years ago, in Washington D.C., a sniper lead to emptied streets, movie theatres, stores and highways and that was only one sniper. Understand what 2000 real bombs, meant to kill people means to the tiny State of Israel. He mentioned some common misconception. Such as when ten years ago the founder of Hamas, Sheik Yassin, was eliminated by Israel and the media called him a spiritual leader. “Hamas is not operating in the name of God. It is a godless people, putting people in harm’s way to inflict harm and thus damage Israel’s image cause international pressure on Israel. It is their ideology and strategy. How many suicide bombers are sons of Hamas leaders? None! Hamas is morally corrupt. In the past when Palestinians were asked how hostilities can end replied that Israel can end the occupation of Gaza. In 2005 Israel and every citizen left Gaza. Eighteen thriving communities were destroyed, greenhouses and farms were offered to them and they said no. The idea was to turn Gaza into the Singapore of the Middle East. Since then over 15,000 rockets and mortar shelling ensued upon Israel. In a period of less than 48 hours, 300 missiles paralyzed Southern Israel. The Egyptians put a truce on the table. Israel said yes immediately and Hamas said no. A few days later the United Nations asked for a 5 hour ceasefire for humanitarian purposes. Israel said yes and Hamas kept on firing. There is only one conclusion to draw when dealing with an enemy that wants us dead. It is not about compromise, not about reaching agreements, not about occupation and not about territory. It is a clash of civilizations between people that celebrate life and people that celebrate death.” Aharoni said this is nothing new, Around 1860 the Steinbeck family who settled in Tel Aviv were murdered by Arabs with the sole survivor being the author John Steinbeck. In 1929 Jews were murdered in Hebron, many while sleeping. The same sentiment exists today – the refusal to accept the other. In the current war, which he describes as perhaps the most transparent military operation to date, people are warned of impending attacks via cell phones messages, hospital administrators are warned to empty buildings (from which missiles were fired or stored) and every day hundreds of trucks deliver food and medicine to the Palestinians. “Plus our society investigates itself – we don’t need others to do that. We use missiles to protect people. They use people to protect missiles. In the end, it’s not what we do that bothers them, it’s what we stand for,” Aharoni concluded. This was an amazing outpouring of positive sentiment towards Israel and condemnation of Hamas. Too bad they can’t take this tutorial on the road. Heaven knows the media and the nations of the world need it.